Arctic Star Exploration is now in the center of what could continue into a Tier 1 diamond discovery at its 100%-owned Timantti Property, Finland. Arctic Star is advancing the recent discovery of a cluster of diamondiferous kimberlites with large upside / world-class potential. Taking point for Arctic Star's exploration team are the same individuals that as lead exploration geologists discovered the Diavik diamond mine in Canada, and the Grib diamond mine in Russia. NEW YORK, NY, March 22, 2019 /Sector Newswire/ -- Arctic Star Exploration Corp. (TSX-V: ADD) (F: 82A1) (US Listing: ASDZF) yesterday provided an update on the status of its over-subscribed private placement. Arctic Star is also the subject of a Mining MarketWatch Journal review. Full copy of the Mining Journal Review may be viewed at https://miningmarketwatch.net/add.htm online. Full copy of Arctic Star's latest press release "Arctic Star Announces Status of Private Placement and Grant of Stock Options" may be viewed here. Arctic Star Exploration Corp. (TSX-V: ADD) (F: 82A1) (US Listing: ASDZF) is a Canadian-based diamond exploration mining company focused on advancing its flagship 100%-owned Timantti Property in Finland, located 17 km from the town of Kuusamo, and only ~450 km SE of the multi-billion dollar producing Lomonsov and Grib diamond mines in Russia. 'Timantti' is the Finnish word for diamond, and Arctic Star is now in the center of what could continue into a Tier 1 discovery. The large land package consists of a 243 hectare Exploration Permit and a 190,000 hectares Exploration Reservation. The caliber of the exploration professionals that are associating themselves and reputations to the project is impressive, they include the former lead geologists that discovered Diavik diamond mine in Canada, and the discovered nearby Grib diamond mine in Russia. In 2018 Arctic Star proved-up a cluster of 4 newly discovered diamond bearing kimberlites ripe with microdiamonds; following caustic fusion processing 1,746 diamonds were found in 987.06kg of samples from four kimberlites, and curve analysis yields +1.18mm stones in each kimberlite. Three of the kimberlites, known as 'the three wolves', are within 300 metres of each other, they were found under only 1 to 3 metres of overburden, only a few hundred metres off the highway, and adjacent to power. Analysis of the distribution of microdiamonds from caustic fusion of samples from Arctic Star's best grading kimberlite structure, named the White Wolf, yielded ~0.7 carats/T (+/- ~20%) commercial stones, an earmark of if not a future mine on its own, certainly part of a future mine. 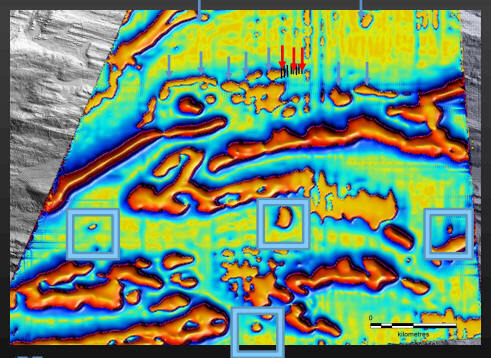 The Company's 2019 exploration plan is to prove the Timantti Project has world-class size potential by confirming more kimberlites; the exploration team will be testing several near-surface anomalous targets that are so apparently indicative it is difficult to think what else the anomalies could be other than more kimberlite pipes. b)(right) -- Location map, note same geological belt as Grib & Lomonosov mines. Exceptional infrastructure: Arctic Star is able to explore for diamonds at Timantti for ~1/3 the cost of what most others spend in elsewhere due to the projects location proximal to exceptional infrastructure (roads, airport, town, power). There are regular flights from Helsinki to the local town of Kuusamo (population ~16,000); its possible to take a taxi from the airport to Arctic Star's first kimberlite discovery in ~20 minutes. Additionally noteworthy, in 2018 two of the kimberlites were discovered simply by excavating anomalies with a backhoe. ADD.V poised for upside revaluation: Currently trading with a miniscule market cap of only ~C$11.3 million, the share price of Arctic Star Exploration Corp. is apt to rise near-term to better reflect the inherent value of its recently discovered diamantiferous kimberlite clusters at the Timantti Property and its potential. The missing ingredient that is holding the share price of ADD.V back is the streets need to see size/tonnage potential, something the Company's geological exploration team is confident it can deliver this 2019. The markets are tougher on diamond exploration stocks now than in the past due in-part to the fact there has not been a new world-class diamond discovery made since 1990. If this was the 1990s and Arctic Star had done what it has done lately at Timantti, the share price of ADD.V would likely be over $3/share already. Purchasers of ADD.V now are getting a deal on shares. Kimberlite structures are rare -- the discoveries to date have mitigated the project risk, with weak hands now out of the stock, and the geological team dialed-in, it won't take much in terms of news flow to attract majors, serious money, and street attention that will jump the share price of ADD.V as the 2019 exploration season advances. Figure 2. (above) Diavik Mine, and Arctic Star's VP of Exploration, Buddy Doyle, he was lead geologist on the Diavik discovery. Diavik has produced over 100 million carats since 2003. Diavik is operated by Rio Tinto and sold 40% to the Washington Group for $1.2B. Arctic Star's exploration team is lead by Buddy Doyle (VP of Exploration and Director) -- Buddy Doyle was the lead exploration geologist that took the Diavik Mine in Canada from discovery through to ribbon cutting. He then stayed on for a term at Diavik during operations as the Senior Exploration Geologist, serving a total of 23 years with RioTinto. He also has other multi-billion dollar discoveries of significance under his belt as well, see his CV at the bottom of this article. Also taking point as Country Manager in Finland for Arctic Star is exploration geologist Roy Spencer (Director). Roy Spencer was the leader of the team that discovered the nearby Grib Diamond Mine across the boarder in Russia, which is in the same geological setting as Arctic Star's Timantti diamond project. Figure 3. (above) Grib Mine and Roy Spencer. Otkritie Industrial Investments purchased Grib for 1.45B. AGD Diamonds recently consolidated with Otkritie . Kimberlites are likely to occur in fields (a.k.a. clusters), which typically contain 30 or more separate kimbelites. The Wolf kimberlites are just the first discoveries in a more extensive cluster. The 2018 works program involved ground geophysics (magnetic, gravity, and EM surveys), excavator till sampling (20 Samples ~50lbsm, and they drilled ~600m yielding 4 diamond bearing kimberlites. Figure 4. (above) -- Imagery from 2018 exploration program. Figure 5. a & b (above) -- location of three wolves and synopsis of drilling which has Arctic Star has conducted. The Three Wolves kimberlites discovered by Arctic Star are not classic Kimberlite pipes. They were initially drilled in the middle assuming they were classical pipes, however the current interpretation is they are part of a dyke, sill system, relatively thick 30m to 35m wide dipping to the North @ 35 degrees. There is evidence this sill system continues and Arctic Star has an opportunity to build kimberlite tonnage at the Wolves, similar to how tonnage was built at Snap Lake, but here Arctic Star has a much thicker sill system. Figure 6. (above) -- White Wolf 2018 diamond results. Gem quality stones in the commercial size: Caustic fusion of White Wolf's kimberlite generated excellent results. Caustic fusion is a process whereby the kimberlite is split, half is kept for reference, and the rest is sent to the lab (there are only 3 in the world; two in Canada and one in South Africa). At the lab the kimberlite is dissolved in extremely hot caustic soda leaving only diamonds remaining. The distribution of microdiamonds in the sample can be plotted and the dots form a curve from which a bi-polynomial expression projects the curve into a large diamond space. This is a technique Buddy Doyle used at Diavik with great success. Analysis shows White Wolf is yielding ~0.7 carats/T commercial stones (+/- 20% to 25% -- this number will become better refined as a larger sample size is processed). It is too early to tell diamond prices as a statistical cloud size is needed, however Arctic Star has 60% white stones in the microdiamonds (anything above 30% is good). Figure 7. (above) -- Grey Wolf, Black Wolf, and Vasa Dykes 2018 diamond results. The indicators being found can't be explained by the discoveries so far, there is obviously lots more kimberlite to be discovered, and Arctic Star's geological team knows exactly where to look. Figure 8. a & b (above) Left: Annotated location map of Arctic Star's Timantti Land Package, Right: Sample sites with indicators. Historic public data and recent till samples taken by Arctic Star show a clear dispersion trains of diamond indicator minerals east of Kuusamo. The Known Kimberlites discovered to date can not explain all the indicator minerals, proof that there are more kimberlites to be found. Red Dots, are sample sites. Red Circles show samples with positive results, the larger the circle the more indicators in the sample. Figure 9. a & b (above) New targets -- Left (above): Annotated UAV Mag survey; Arctic completed a 600 km2 UAV magnetic survey in the Summer-2018, adding to its Winter ground Mag. Greenstones belts and gabbro sills dominate the image as long linear Mag highs. Seen in the image are some of the new targets highlighted with arrows, those are kimberlite targets. Kimberlite targets in the quartzites tend to stand out. Right (above): Annotated survey showing nanoteslas (nT). 38 New untested drill targets for 2019. Red arrows point to the top priority targets. As little as 1-3 m overburden. The Wolves seem to form an East-West trend (Wolf Cubs). The plan is to begin excavator sampling in March 2019, drill testing in June 2019. The certainly level runs high: One section of the survey shows a trending line of anomalies that appear similar in structure that typify kimberlite. The anomalies continue for another 1.5 km. Elsewhere Arctic Star has intense anomalies in the 1000s of nT, then there are anomalies in the 100s of nT that are key, likely very quartzite -- the targets Arctic Star is going for are along the Wolf trend and they are sort of circular, 100m wide, Lac De Gras/Diavik-style sort of targets in the quartzites. It begs the question "What else would intrude the quartzite and be 100 nT?" -- the logical answer is kimberlite (nothing else makes sense). Figure 10. (above) -- Mag filter designed to highlight kimberlite like targets. Boxes highlight targets in new Exploration permit (note: one of the targets is ~200m across, looks dumbbell shaped, which kimberlite often looks like). Blue arrows show targets in current permit. Chart 1. 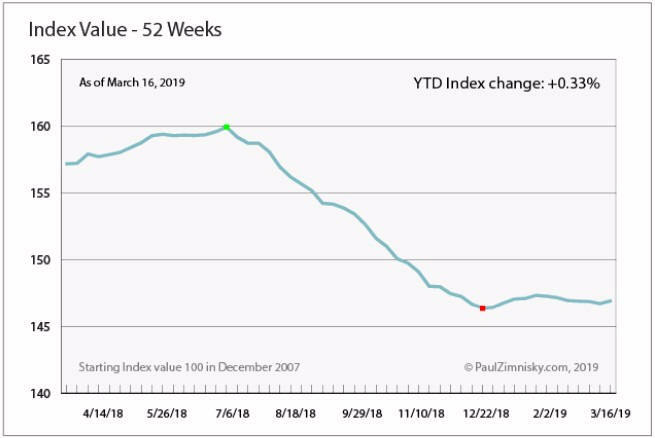 (above) Zimnisky Global Rough Diamond Price Index. Commentary: Gains made in early 2018 have been lost in the later part of that year, stabilizing now. Most of the price pressure is in the 'small good', less than 3 pointers (0.3 carats). Mainly due to producers reprocessing old tailings where smalls dominate, therefore short lived. USA & China demand strong. Figure 11. 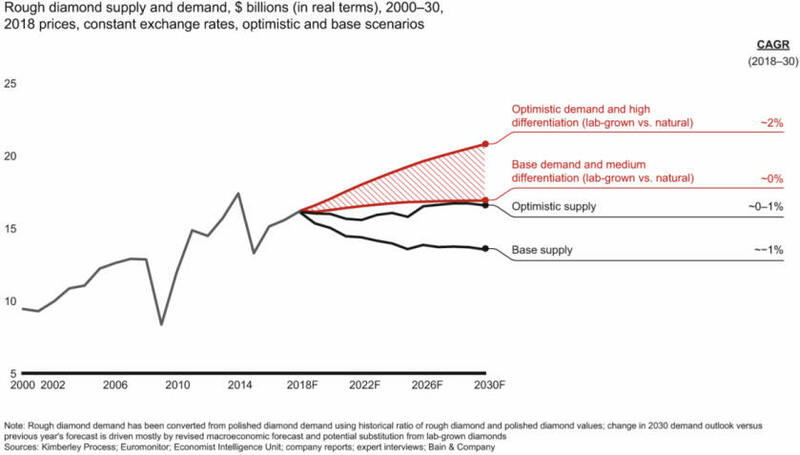 (above) -- World Diamond Production Forecast (Source: Bain & Company published December-2018). Shortfall in global new rough diamond supply growing; The above annotated chart of World Diamond Production Forecast shows a growing shortfall. Argyle diamond mine is scheduled to close 2020. Udachnya and Mir diamond mines have recently closed (Mir cannot go underground due to natural gas seepage into mine). Very little global diamond exploration since the 2008 GFC. No new significant discovery since 1990’s. Note on synthetic (artificial) diamond market: The artificial market is being relegated to junk status and not impinging on natural market. Demand for synthetic diamond production in 2018 was ~7M carats. Compare that to natural demand (of ~130M carats), as a portion of the market synthetics is small. Synthetics have been around for a while, however they have gotten better of late. Debeers and the Geological Institute of America have deployed detection instruments in every reputable jewelry store in the the world -- so you can tell the difference. In order to speed the departure of the artificial market piggybacking off of the natural market, and relegate it to a separate market, in November 2018 DeBeers began producing their own synthetics on their own patented equipment/process, and they are pricing way low -- making a separate market. Simply look to rubies, emeralds, and sapphires -- they have had very good synthetics since the 70s and they are separate markets (one can go into a lapidary store and buy a thumb-size artificial ruby for $70, whereas a thumb-size natural ruby would be $multi-millions). Figure 12. (above) Diamond Pipeline (source of data: Bain & Company) -- The table shows where the money goes between mining and getting a very nice ingot. The big takeaway from a review of margin data is that its a producers club; diamonds are one of the only mined commodities where producers set the price, not the buyers. Diamonds are not industrial driven like most other mined commodities. Large stock piles have been gone since the mid-90s. Occasionally the producers will ring up each other "We are going to hold back on X-size group, we are seeing weak prices", and those diamonds will get stored at the mine site. This is a healthy mechanism for the producers as it would be irresponsible to flood the market. If one or two sites hold back on supply of a size, the price comes back. It is a quantum leap to do the bulk sample, so Arctic Star wants to bring as much selection of kimberlite to that quantum leap before it makes it.